The A/P/A Institute at NYU Visiting Scholar Program extends specified courtesy titles and privileges to scholars of distinction who visit the Asian/Pacific/American Institute at New York University in order to engage in research and scholarship, and in general scholarly and cultural interaction with New York University’s faculty and students. Learn more and apply here. Tomie Arai will conduct research for a bilingual mapping project that will center on placekeeping efforts in New York’s Chinatown, while drawing connections with Chinatowns across the country. The project will address the following question: How can we engage communities in the process of preserving culture and history, and re-visioning the future? Working collaboratively, Arai and members of the Chinatown Art Brigade and the Chinatown Tenant’s Union will co-create a large map for CAAAV Organizing Asian Communities’s storefront offices. This map of Chinatown will feature photos and illustrations that will be augmented, unlocking tenant stories and housing rights information. An accompanying interactive website will serve as an archive for CAAAV’s thirty-five-year history of radical organizing. Minju Bae is a doctoral candidate in the History Department at Temple University, and her dissertation, “One Rise, One Fall: Labor Organizing in New York’s Asian Communities since the 1970s,” examines labor mobilizations in an era deeply shaped by the Asian American movement, the Cold War, and economic scarcity. Her research looks at how labor organizing occurred in, alongside, and apart from union formations, as Asian/American workers and migrants sought to make a living in a global American city. Gaiutra Bahadur is at work on a book exploring the “beating heart of our American idea” (as President Obama once put it). Through American lives that intersected in Guyana, her birthplace, once Britain’s sole colonial foothold in South America, she will interrogate the nature of the United States: Is it exceptional nation? Democracy’s guardian? Immigrant beacon? Heir to original racist sins? Selma Siew Li Bidlingmaier will continue her postdoctoral project Fit for the City: A History of New York’s Gentry-fication tracing the history of New York City’s current “housing crisis” back to the Gilded Age and the Progressive Era. Her work explores how intertwining and contesting ideologies of social Darwinism, euthenics, and eugenics informed a politics of the home that was calibrated to serve capital’s need during the period of industrialization and mass migration. It also demonstrates the ways in which these ideas of human, social, and civic development were bolstered by new technologies of measurement such as statistics, risk assessments, demographics, and cartography that directed an urban and housing reform which produced and maintained a cityscape of racial, classed, and gendered inequalities. Chitra Ganesh has been researching utopic impulses in cultural production within the context of early Asian immigration and its restrictions. This includes looking at the role artists of color including those of Asian and South Asian origin and ways in which their contributions to a lager national wine our such as WPA mural and projects and the formation of early artists’ collectives on the west coast. Andil Gosine is Associate Professor in Environmental Politics, Justice and Arts at the Faculty of Environmental Studies at York University. His research and artistic practice considers imbrications of ecology, migration and desire, and he will be completing work on a variety of projects, including a book, documentary and exhibition. Allan Punzalan Isaac’s “Beside/Time” examines how a variety of immaterial labor performed by Filipinos—carework, teaching, call centers—while producing bodily and affective disciplines and dislocations also generate and explore vital affects, alternative socialities, and ultimately, cultural expressions. As debates on immigration and security, global networks of labor, and popular nationalism come to fevered pitches these past few years, what are the implications of alien bodies in our intimate worlds? The book project explores how these modes of making time and new proximities are re-articulated in a capacious archive of storytelling in fiction, in the musical, in ethnography, and in a documentary film. Leeroy Kun Young Kang will continue research on his project, The Belated Archive. Drawing from an archive of experimental video and film work produced by queer A/P/A visual artists and filmmakers from 1990-2004, the project aims to uncover, assemble, and recirculate these works in dialogue with current perspectives on racialized sexuality, gender transgression, video and film technologies, and archival curation. Within the coming year, Kang will be working towards publishing a text that will discuss the project’s curatorial methods and archival process while exploring how “belatedness” can serve as a temporal framework in how we can look at the archive’s future. Sarah K. Khan will complete the script for a documentary on women farmers. She continues her work on developing the multidisciplinary Migrant Kitchens, Cookbook of Gestures, and more recently research on the fifteenth century manuscript on food and culture from central India. Her film Surviving Surveillance, Catering to America is the official selection for several South Asian film festivals. ManSee Kong will continue archival research and post-production work on her documentary about Danny Chen, a nineteen-year-old US Army Private from Manhattan Chinatown who was racially abused and hazed to death by supervising officers while on deployment in Afghanistan. Kong’s documentary centers around the advocacy that unfolded after Chen’s death, exploring themes related to military culture, masculinity, and the American dream. Kong is an independent filmmaker, co-founder of Chinatown Art Brigade along with Tomie Arai and Betty Yu, and a co-founding member of Gongming Collective for Language Justice. Alpesh Kantilal Patel will be working on a book project that offers an alternative to the way in which global art histories and lesbian, gay, bisexual, trans*, queer, and intersex (LGBTQI) art histories are being conceptualized. Drawing on creolization theory, his monograph, tentatively titled “Transregional Entanglements: Sexual Artistic Geographies,” aims to create productive “relations” between and among artworks concerned with LGBTQI issues in countries that are often considered part of the Global South and the Non-Aligned Movement. Margaret Rhee will conduct research for her book project, How We Became Human: Race, Robots, and the Asian American Body. How We Became Human focuses on Asian American racialization in three periods of technological transformation: the mid-nineteenth century, the 1960s, and the contemporary moment. Specifically, Rhee will investigate the cultural contexts of artist Nam June Paik’s work, and the intersections of his new media aesthetics and biographical writing on racial identity. Vivian Truong will continue her dissertation project, “Whose City? Our City!” Asian American and Multiracial Movements against Police Violence in New York. Examining cases including the 1995 police killing of Chinese American Yong Xin Huang in Brooklyn and the eviction of Vietnamese street vendors from an increasingly gentrifying Chinatown under the broken windows policing regime, she situates resistance to police brutality within a broader struggle over the spaces and future of New York as it became a “majority minority” city in the late twentieth century. The project draws on oral history and archival sources recovered through a public history project she has led with CAAAV Organizing Asian Communities, which documents over thirty years of Asian American movement-building in New York City. Larry Tung will conduct research on the media images of Asians in the American film and television industry. This project seeks to explore how some of Hollywood’s more progressive producers and writers are challenging media stereotypes of Asian Americans with television shows like Master of None and Fresh of the Boat, and more recently, with the box office hit, Crazy Rich Asians, the first major studio production with an all-Asian cast in twenty-five years. Hyo Kyung Woo will work on her manuscript, “Korean Englishes, Uneven Asias, and the Transpacific Literary System, 1895-1945.” This project investigates the role of English as a transpacific mediatory language for a group of Korean writers/translators during the Japanese colonization of Korea, circa 1895-1945. Woo argues that Korean intellectuals of the colonial period appropriated the privilege accorded to the English language and literature as an anti-colonial tool against Japanese rule, incorporating their anti-Japanese aspirations into their own Anglophone literary practices. Thanushka Yakupitiyage will conduct research on the intersection of climate and migration, and further explore her interest in sound culture and using sound as artistic expression. She will investigate the impacts of the current Administration on immigrant communities, and consider the role of artist-activists within the current political moment. 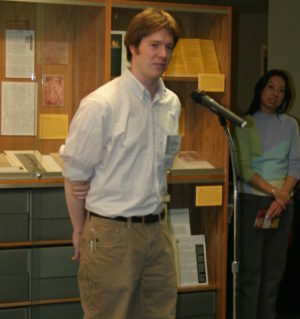 Dylan Yeats will conduct research at the NYU Archives & Special Collections as well as other local repositories on Chinese American activism in New York City in the late nineteenth century, and especially how some Chinese Americans allied themselves with sympathetic elements of the city’s Protestant churches to combat discriminatory policies. Many of these Chinese American activists lived and worked near Washington Square, and some even went to NYU, making Greenwich Village an under-recognized site of Asian American organizing for over 130 years. Yeats will devise ways to preserve and promote this history. nterested in joining the group, please email apa.rsvp@nyu.edu. 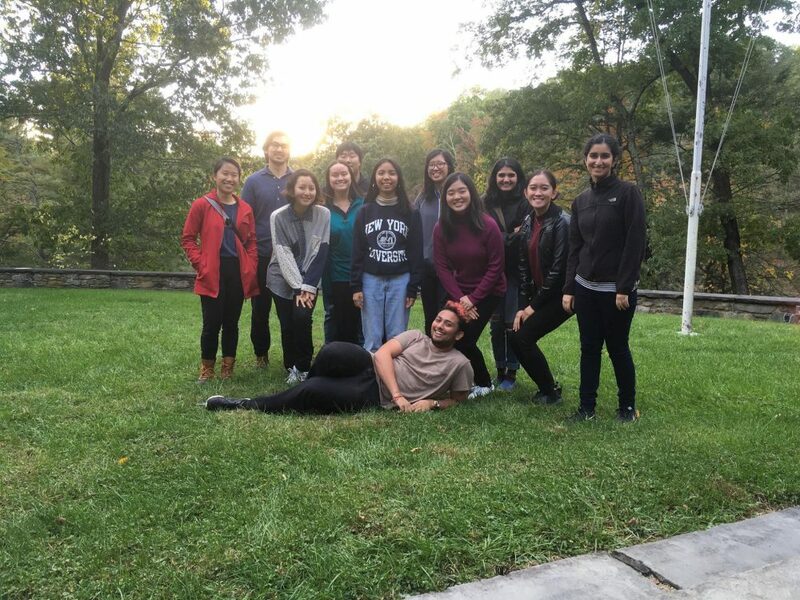 The Asian/Pacific/American Studies Assistant Professor & Visiting Scholar Working Group was founded in Fall 2018 to support NYU junior faculty and post-doctoral scholars working in the field of A/P/A Studies. The group meets at the A/P/A Institute at NYU for co-writing sessions, book chapter and article workshops, and professional development conversations. If you are an NYU faculty member or post-doc interested in joining the group, please email apa.rsvp@nyu.edu. 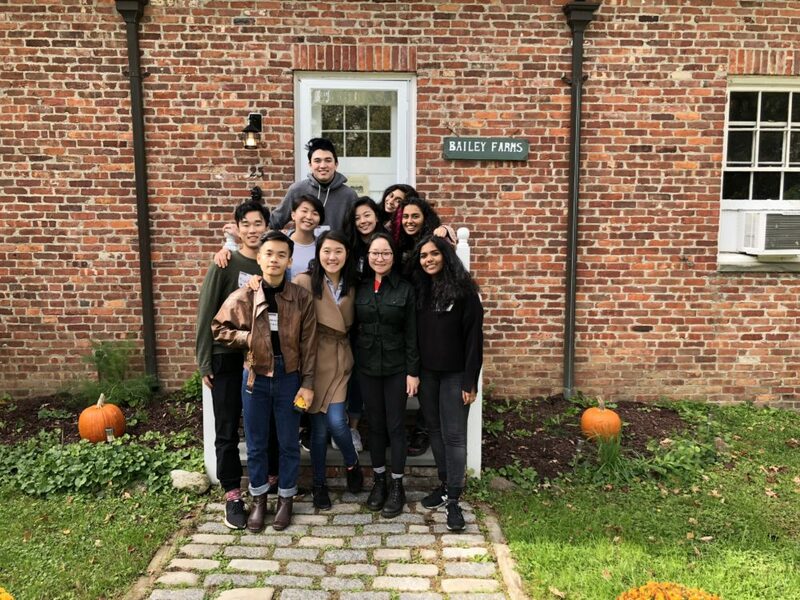 The Asian/Pacific/American Studies Program, together with the A/P/A Institute since 1996 has been the home for students, faculty, staff, and alumni who sought to collaboratively explore the complex A/PA experience — deciphering the present, reclaiming the past, and anticipating the future. Ten years later, in September 2005, the A/P/A Studies Program, together with NYU’s Africana Studies, American Studies, Gender & Sexuality Studies, Latino Studies, and Metropolitan Studies, came together to form a new, interdisciplinary, one-of-a-kind Department of Social & Cultural Analysis (SCA). A/P/A Studies offers a minor and major course of study, and boasts a growing list of accomplished faculty. While the Program and Institute have become separate entities since A/P/A Studies became part of the SCA Department, they still work closely together to collaborate on exciting conferences, events and new research. Learn more about the A/P/A Studies Program in the Department of Social & Cultural Analysis. The Asian/Pacific/American Studies Research Guide is an NYU Libraries directory of books, special collections, and online resources related to A/P/A Studies. Applications for the 2018-19 cohort of A/P/A BRIDGE are now closed. Please check back in Fall 2019 for the 2019-20 application. A/P/A BRIDGE seeks to include a diverse group of student leaders from various backgrounds (race, ethnicity, gender, sexuality, ability, spirituality, academic study, and class). Applicants with a range of experiences are encouraged to apply, and we welcome all applicants with an interest in issues affecting A/PA communities. 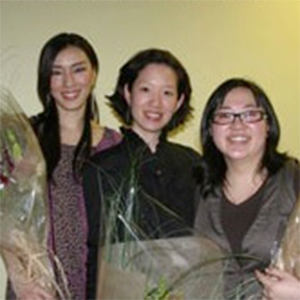 In January 2011, three NYU A/P/A Studies majors appealed to the A/P/A Institute at NYU for support and guidance to develop an A/PA leadership program for NYU undergraduate students. In March 2011, a group of eight A/PA student leaders was recruited to pilot a leadership training weekend. In February 2012, this pilot was expanded to involve a group of 14 undergraduate student leaders to participate in a leadership training weekend and subsequent weekly meetings to develop public speaking, workshop facilitation, and project leadership skills. These skills were implemented at the annual NYC Asian American Student Conference held at NYU in April 2012. 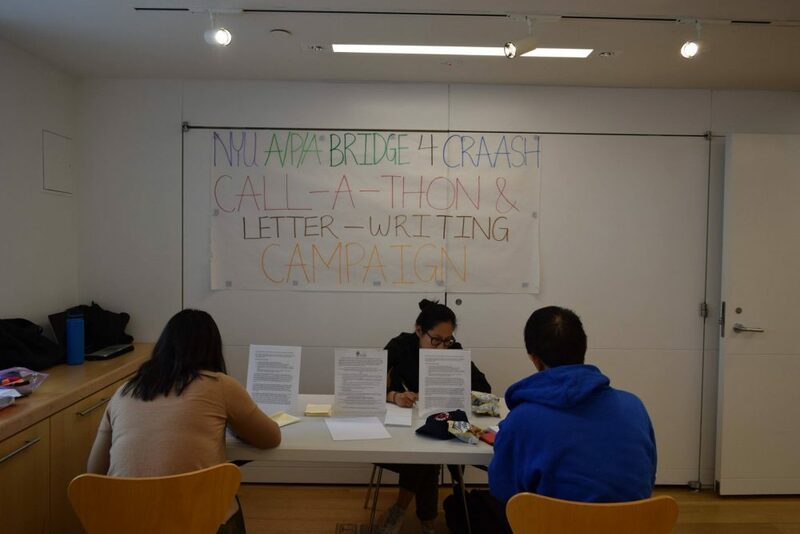 In Fall 2012, A/P/A BRIDGE became a year-long program, again culminating in April 2013 at the annual NYCAASC. As the A/P/A Institute Graduate Archives Scholar, Pooja will continue work on cataloging, preserving, and digitizing the video portion of the Jack G. Shaheen Collection on Arabs in U.S. Film and Television for which she created a master inventory in summer 2016. She will also help to assess collections for potential donation to NYU and facilitate intake for new archival material. Paul co-curated, with the Gay Asian Pacific Islander Men of New York (GAPIMNY), an exhibition to celebrate the organization’s 25th anniversary and to mark the donation of their records to the NYU Tamiment Library & Robert F. Wagner Archives. As a Graduate Scholar in A/PA Archives, Alexandra processed the Yun Gee Papers at the NYU Fales Library & Special Collections and began working on developing digital galleries of A/PA collections at NYU. Inspired by her introduction to archival research during her undergraduate years at NYU, Janice pursued her interest in archives as the Graduate Scholar in A/PA Archives from 2011-13. One of her major achievements during her first year was assisting with A/P/A Institute’s first NEH-funded Summer Institute, “Re-envisioning American Art History: Asian American Art, Research, and Teaching.” In her second year, she processed the Midori Shimanouchi Lederer Papers. 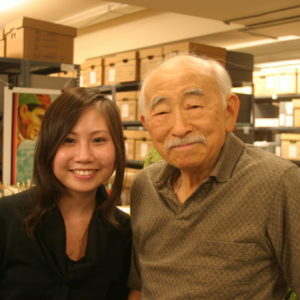 D. Daniel Kim worked on the Documentary Heritage Project and assisted in bringing the Asian Pacific American Labor Alliance and Asian American Arts Centre archives to the Tamiment Library & Robert F. Wagner Labor Archives. Daniel co-curated the A/P/A traveling exhibit Marvels & Monsters: Unmasking Asian Images in U.S. Comics, 1942-1986 based on the William F. Wu Comic Book Collection housed at The Fales Library & Special Collections at NYU. 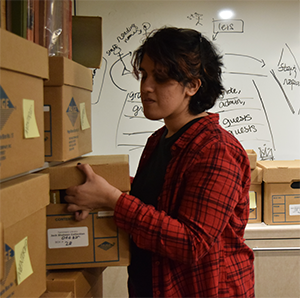 As the Graduate Scholar in A/PA Archives, Amita worked on the Documentary Heritage Archives Survey, identifying existing and potential archival collections relating to the history of A/PA communities in New York City. She curated A is for Arab a traveling exhibition featuring items from the Jack G. Shaheen Archive, and edited the accompanying publication. At the A/P/A Institute, Ng Tam worked on the Documentary Heritage Project, surveyed collections relating to the New York A/PA community. She has also assisted on a range of projects relating to A/PA Archives, including processing the George Yuzawa Papers, sorting of the Yoshio Kishi / Irene Yah Ling Sun Collection, and managing the active files of the East Coast Asian American Art Project. Joining A/P/A Institute as a second year graduate student in the Archives & Public History Program, Hillel Arnold served as a starting member of the Documentary Heritage Project team alongside I-Ting Emily Chu and Y.H. Nancy Ng Tam. With extensive archives processing and surveying experience from Tamiment Library & Robert F. Wagner Labor Archives as well as the Woody Guthrie Archives, Arnold was instrumental in helping to jumpstart the DHP. Emily’s research focus concentrates on Asian/Pacific/American women, activism, and archives. While at A/P/A Institute, Emily co-curated Art, Archives and Activism: Martin Wong’s Downtown Crossings, and was a member of the Documenting Heritage Project team that surveyed Asian American collections in New York. While at A/P/A Institute, Dylan co-curated The Archivist of the Yellow Peril and curated Persistent Light: Eugenia Sumiye Okoshi and George Mukai. He also worked on the Yoshio Kishi / Irene Yah Ling Sun archive collection and wrote the essay titled “Documenting Exclusion and the Logic of Difference” for the book Yellow Peril: Collecting Xenophobia published by A/P/A Institute, 2008. Pooja Desai catalogs the thousands of VHS tapes contained in the Jack G. Shaheen Collection on Arabs in U.S. Film and Television, September 2016. 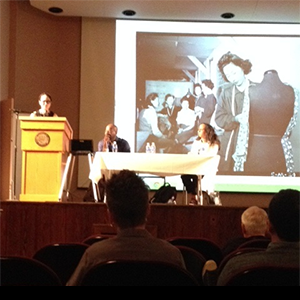 Alexa Giffen (far left) presents at the Archival Education & Research Institute in Pittsburgh, July 15, 2014. Janice Liao (far left) at the Society of American Archivists conference, where she accepted the Diversity Award on behalf of A/P/A Institute at NYU. 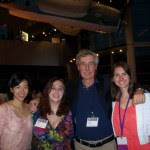 She is pictured with Professor and NYU Archives and Public History Program Director Peter Wosh (second from right) and fellow classmates, August 2013. 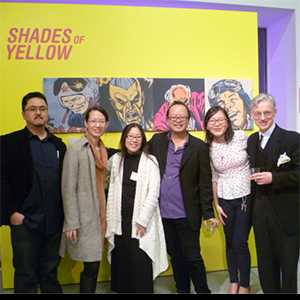 D. Daniel Kim (far left) at the “Marvels & Monsters” exhibition opening at Asian Arts Initiative in Philadelphia, February 3, 2012. 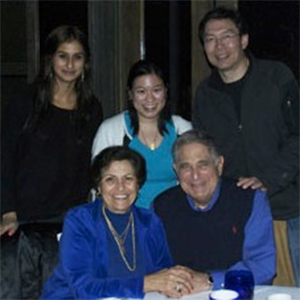 Amita Manghnani (top left) with Jack and Bernice Shaheen (bottom row) and the A/P/A Institute oral history documentation team, February 21, 2010. 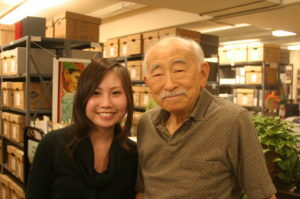 Nancy Ng Tam with George Yuzawa at the celebration and exhibition of The George Yuzawa Papers at Tamiment Library, October 21, 2009. Hillel Arnold (top row middle) with the Documentary Heritage Project team, April 2, 2009. 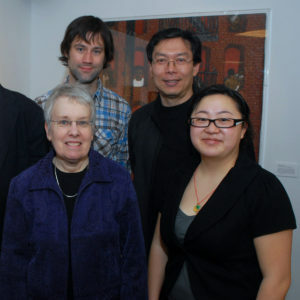 Emily Chu (far right) with fellow curatorial staff at the opening of “Art, Archives and Activism” exhibition, March 6, 2009. Dylan Yeats at the re-opening of “Archivist of the ‘Yellow Peril'” exhibition, March 7, 2006. 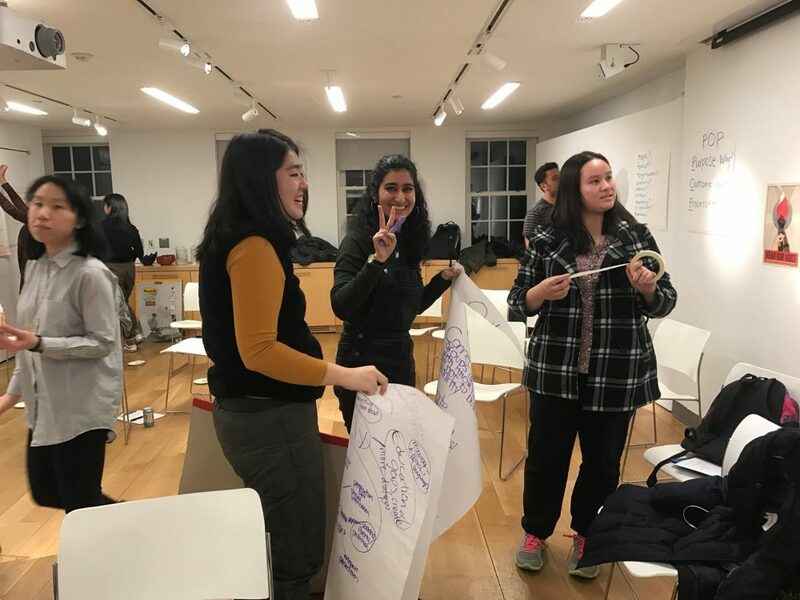 A/P/A Studies Program and A/P/A Institute were founded together in 1996 after a group of ambitious and dedicated students, faculty and staff at NYU lobbied the administration for a program and place they could call their own. Indeed, we would not be here today — offering an A/P/A Studies major and minor, hiring and supporting faculty and staff, providing public events and programming, and building a major research archive — had it not been for these students who we proudly call our alumni. We want to hear from you — whether you majored/minored in A/P/A, took a class, attended an event, or just never got a chance to do any of the above but want to get involved now. So email us at apa.alum@nyu.edu with any updates, questions, suggestions, or news you want to share, and complete our alumni form in order to be added to our database. We look forward to seeing and hearing from you at an upcoming event!